An introductory college algebra course, often referred to as "Algebra 1" or "College Algebra," is a requirement for many academic programs. Some college algebra courses list the intended audience, such as math, engineering or business students who need the class to further their academic goals. Students who pass an equivalent algebra course in high school can often bypass the course in college. Algebra course descriptions vary by college or university, but most cover the same topics and have similar prerequisites. College algebra courses review elementary algebra concepts that were introduced in high school, such as set operations, factoring, linear equations, quadratic equations, exponents, radicals, polynomials, rational expressions, rectangular coordinates, ratios and proportions. 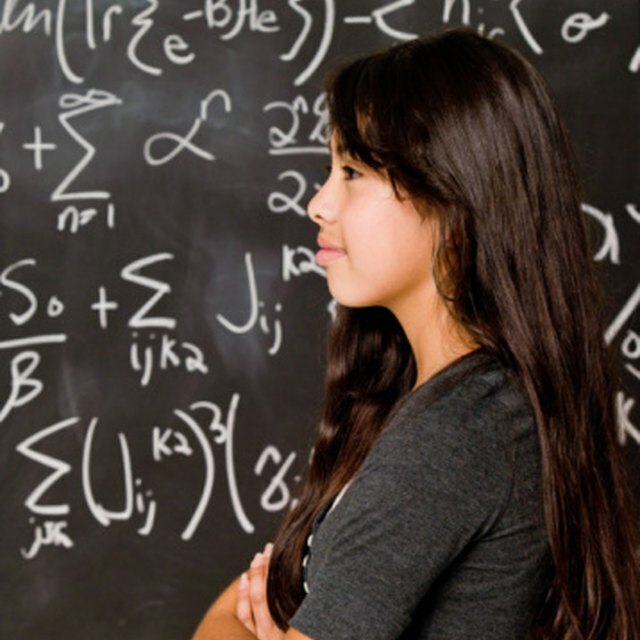 A passing grade in an entry-level college algebra course is often required before students can take more advanced math classes, such as precalculus, calculus, trigonometry or business math, according to the University of Akron. The content in a college algebra course centers on algebraic relationships, functions and graphs that go beyond basic high school algebra. Students learn to solve for one or two unknown variables in a variety of complex equations. They also learn to graph intermediate-level algebraic functions, such as single-variable polynomial functions. Instructors cover topics such as quadratic and rational inequalities, linear and quadratic variables, remainder and factor theorems and exponential and logarithmic functions, according to the University System of Georgia. Entry-level college algebra courses help prepare students for upper-level math, science, business, computer and engineering classes. Course descriptions might include absolute value equations, matrices, conic sections, geometric sequences, binomial theorem, permutations, combinations, probability and statistics, and linear programming. Teachers might also cover inverse functions and properties of logarithms, according to the University of Missouri. The course description for a college algebra course lists how many credit hours a student will receive when she completes the requirements and passes the class. Most college algebra courses are worth three or four credit hours. For example, students who pass an entry-level college algebra course at the University of Akron receive four credit hours. Students enrolled at Texas State University in San Marcos, Florida State College in Jacksonville or the University of Minnesota in Minneapolis receive three credit hours upon completion of similar college algebra classes. Each university has prerequisites that students must meet to enroll in entry-level college algebra courses. Some universities require students to take school-issued math placement tests to determine eligibility; others require students to score certain marks on college placement exams, such as the ACT or SAT. For example, Texas State University requires students to score a minimum of a 21 on the math section of the ACT, a 435 on the math section of the SAT, a 26 on the school's math placement exam or pass a 100-level college math course. The University of Minnesota allows students to enroll in a basic college algebra course if they successfully completed three years of high school math. Tucker, Kristine. "College Algebra Course Description." Sciencing, https://sciencing.com/college-algebra-course-description-12743872.html. Accessed 24 April 2019.